An ideal location for work or play! The Footprints on the Bay condominiums offer great amenities, including a picnic area with charcoal grills, a heated swimming pool, and a weight room. 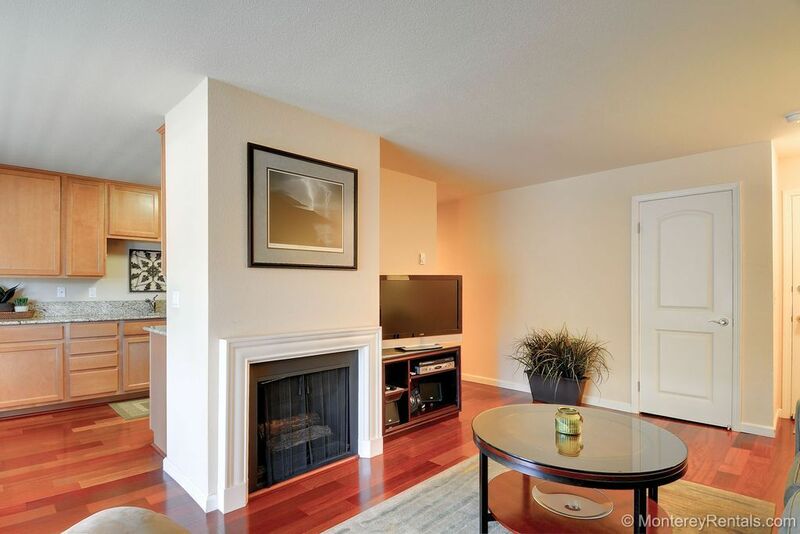 This single-story one-bedroom condo has a fireplace and is tastefully furnished with your comfort in mind. And you'll enjoy the outdoor spaces at this property as well as the indoor ones. There is a balcony just off of the living room/kitchen with patio furniture, and the oak trees that line the grounds are a great place to relax and read a book. This property has beautiful hardwood floors in the living room and kitchen, carpet in the bedroom, and a tile bath with a shower/tub and a washer/dryer. The modern kitchen has granite countertops, stainless steel appliances, plenty of cabinet space, and a bistro dining table that seats four. This property is just a short drive to downtown Monterey and Fisherman’s Wharf and freeway close to Carmel, Pebble Beach, Pacific Grove and Salinas. Access to this home is easy – only one step up to the entry door! I loved staying at Footprints 303. The condo is sunny, nicely furnished, and very well equipped. I appreciated that it was not cluttered and it was so clean. The king size bed was so comfortable. The complex is perfectly situated, safe, and nicely landscaped. I felt very much at home there. accomodations lovely, would have enjoyed a salad bowl for all the wonderful farmer's markets finds.